Harrogate Pythons' Dan Shortman halts a Rotherham Phoenix attack. Dan Bird's side began the weekend second in the Yorkshire Three standings, seven points ahead of their third-placed hosts, but a 16-5 victory in South Yorkshire saw them pull even further clear. The division's top two will go up at the end of the season, and with an 11-point cushion and just four fixtures remaining, the runners-up spot is now 'Gate's to lose, while they are also still very much in the title race. Saturday's fixture was played in testing conditions with rain pouring and strong winds gusting across the pitch. The Pythons did however manage to get off to a fine start following a drive by Matt Leach. The ball was then moved quickly to winger Matt Halpin, and when he was halted, play was quickly reversed for Joe Bentham to crash over with just three minutes on the clock. Rotherham responded with a series of pick-and-drives by their big pack, but they were met with stern resistance from the ‘Gate pack with Steve Smith and Steve Lennox to the fore. The hosts were eventually rewarded with a penalty in front of the posts, however the attempt was dragged wide. Liam Kernoghan’s searching kick then forced a line-out, from which Hugh Tatlow won quick ball off the top for Jed Carr. He in turn offloaded to Kernoghan, who made it over the whitewash but was held up. The Phoenix defence did however stray offside and Sharp stepped up to extend the away lead to 8-0 with a well-struck 10th-minute penalty. Again Rotherham responded by keeping the ball tight in the forwards and driving relentlessly towards the ‘Gate line. The Pythons were eventually penalised and their hosts opted for a line-out, from which their number eight was able to stretch over the line to open his team’s account, narrowing the gap at 8-5 with a quarter of an hour on the clock. Undeterred, Gate played conditions perfectly, with sniping runs from Carr and Rich Paterson taking them over the gain-line and Kernoghan’s intelligent kicks keeping Phoenix on the back foot. A high tackle on Paterson led to another penalty, however Sharp’s long-range penalty dropped short. Bentham and Sharp were both then held up over the line, but another penalty was forthcoming and this time Sharp converted for an 11-5 lead at the break. The second period saw Rotherham persist with their tactic of keeping the ball in the forwards, while ‘Gate continued to try spread the play wide. 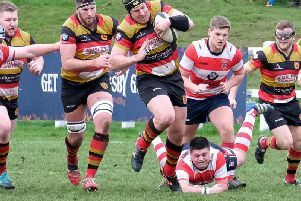 And it was the visitors whose game-plan paid off when, following a scrum, Bentham spotted a gap and offloaded to the supporting Sharp, who managed to squeeze the ball down despite the attention of several defenders. With conditions deteriorating, Phoenix pressed hard for a way back into the match, however ‘Gate defended resolutely and made it through to full-time unscathed.